Making Adventure A Family Lifestyle - Those Who Dream, Inc. I spent half a decade traveling around the world with a backpack and a pair of flip-flops. My journeys took me to twenty countries, and my life was forever wrecked for living an average life. The powerful aspect of my life then wasn’t found in the globetrotting adventures I thought were epic. My life was an adventure because my lifestyle matched my heart– those things that called out life within me. This morning, I find myself in a very different place than I did before, but the adventure is the same. I wake up each morning in a small town new New Orleans and my heart is alive much in the same way it was in the markets of Jerusalem or the dirt paths of Africa. But this time, my adventure has a face: these two. I meet so many moms and dads who have been tricked into believing that their lives post children have to somehow become hectic and unfulfilled. I was naive enough to think that way at one point too. Until the day my world ended. On a rainy morning in August of 2014, my third baby, Beau died just before birth. I got up again and hoped once more. But like some families are keenly aware, lightening can strike twice, and we buried our 4th baby, Montgomery in July of 2015. For a long time Josh and I struggled to find a way to live again. Each day is a new mountain for both of us in grief — even for our two living children. But we are determined to be intentional about loving life again. This morning I woke up and heaped a spoon of dark roast coffee in my french press, surrounded by the sounds of small town America, and I realized something. My heart is coming alive again. Our family is a homeschooling tribe. We love living, loving, and learning together all over the world. But where we are in the world is not what makes the adventures alive — it’s being together. 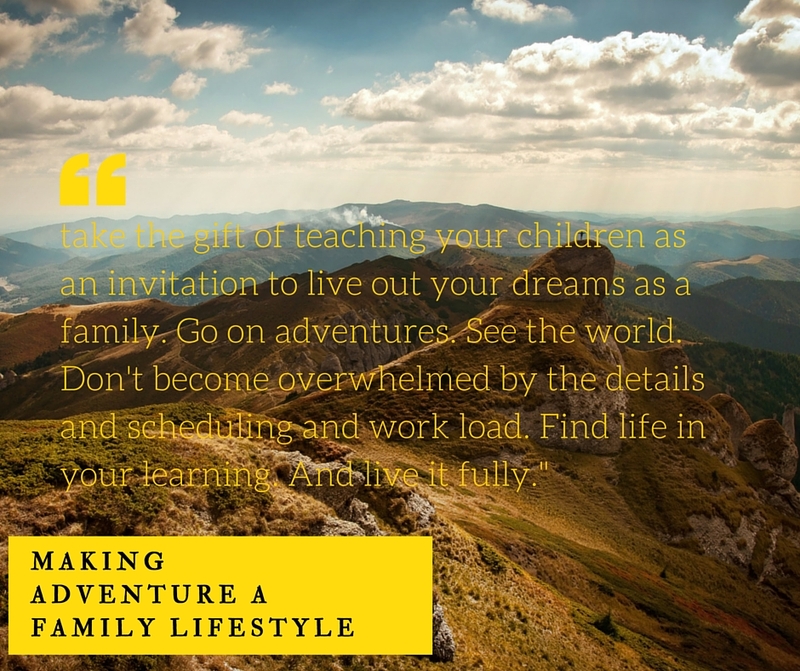 If you’re a home school mom or dad who has lost touch with that sense of adventure, I want to encourage you that it is all around you. There are still days that I look up and wish all four of my stair-step kids were running around me. I ache for that reality. But that ache drives me to squeeze every ounce out of the life I have been given with those I do have. Creating a lifestyle of homeschooling in your family means that you find the adventure in the mundane, ordinary things, but also live our your heart-beat as a family.We use Mother Goose Time curriculum for our children, and this month we have been focusing on Health and Fitness in our learning journey. God challenged my husband and I to live out what we have been learning and teaching our kids. So we did something different this month. One week contained lessons on types of foods, including veggies, fruits, dairy and protein. As our children were learning where our food comes from, we decided to take the plunge and buy as much of our monthly food needs locally from farms as we could. When we worked on protein, we took the kids to buy farm fresh eggs. We made our own bread when learning about grains, and in a few days we will make our own strawberry jam to barter with for local raw honey. Our kids aren’t just learning what is necessary to make it in the American public school system – they are learning how to live out their adventures in learning. They are able to reach out in front of them and touch what they are learning about. And those experiences will shape who they one day become. As a home school mom, I want to encourage you to take the gift of teaching your children as an invitation to live out your dreams as a family. Go on adventures. See the world. Don’t become overwhelmed by the details and scheduling and work load. Find life in your learning. And live it fully.